Open studio is simply that - open studio. It’s a fabulous environment for all artists, from all walks of life. Our abilities range from amateur to professional and everyone is welcome. A wide variety of medias are also represented which include: oils, acrylics, encaustic, mixed media, watercolor, collage, pencil and pastels. Whether you’re looking for motivation or need new ideas, you’ll find that, and much more here. Not only do we have supportive critiques, it’s a room full of friendship, laughter and a place for those to share in their love of the arts. For a great artistic environment, come to Foothills Art Center any Friday between 10 am and 3 pm and join us - we’d be delighted to have you. 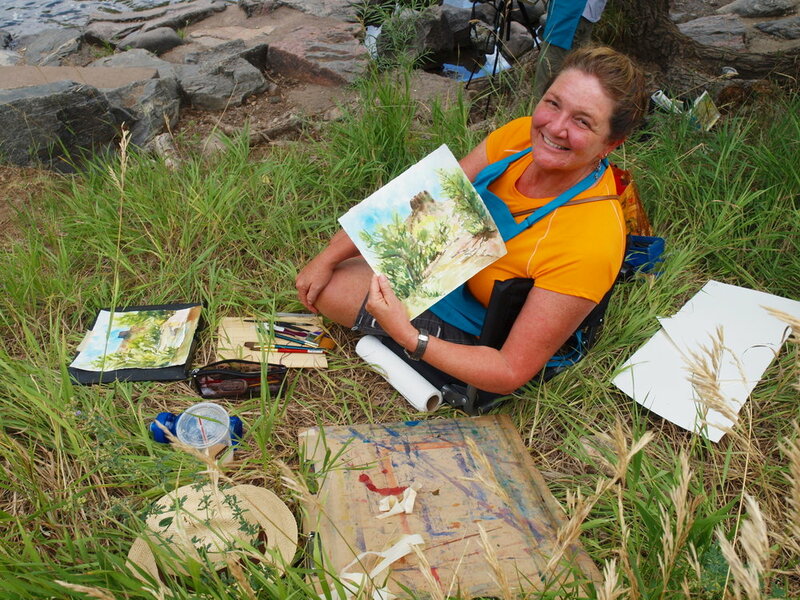 Foothills Art Center and its Open Studio group will host its 2nd Annual Plein Air Event in conjunction with the Foothills’ ARTSWEEK Event. Our event is intended for the novice to professional artist. All participants may exhibit up to 2-plein air artworks at the Reception. Participants may choose to enter the official Plein Air Competition and to sell up to 2-Plein Air artworks created during this event at the Reception.